This page contains Monthly Weather Averages for the Town of Jackson, Wyoming including temperature, precipitation and snowfall data. You will also find average monthly snowfall numbers for the mountains at around the 9,000-foot elevation, extrapolated from Jackson Hole and Grand Targhee Ski Areas. The weather around Jackson Hole varies greatly from year to year, season to season, and day to day. It is the extremes of our daily weather which create our monthly averages. This page contains graphs and tables of the monthly averages for temperature, precipitation and Snowfall. These graphs were created from the last 50 years of weather data taken at the Jackson, Wyoming Climate Station, located on the north end of town at the U.S. Forest Service Office. Mountain snowfall data is averaged from he last 30 years of data from the Jackson Hole and Grand Targhee ski areas. These are the numbers which define our climate. They are what is considered "normal" month by month, if there really is such a thing as normal! Hopefully, these graphs will give you a "feel" for what it is like here season to season. Click for a graph of average monthly high/low temperatures in Jackson. Trivia Note: The hottest it has ever been in Jackson is 98 degrees. The coldest temperature ever recorded was 63 below zero. Click for a graph of average monthly precipitation in Jackson. Trivia Note: The wettest month of the year in Jackson is May. The driest month of the year in Jackson is February. Click here for a graph of average monthly snowfall in the Town of Jackson. Trivia Note: The snowiest month of the year is January. 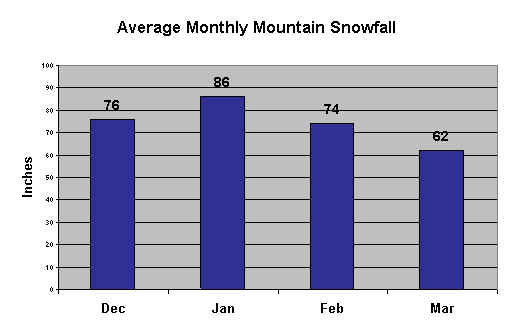 Click here for a graph of the average monthly snowfall in the Teton Mountains for the winter months, December through March. Click here for a Summary Table of all monthly stats for the Town of Jackson. Do you have a question about Jackson Hole's Climate or Weather?